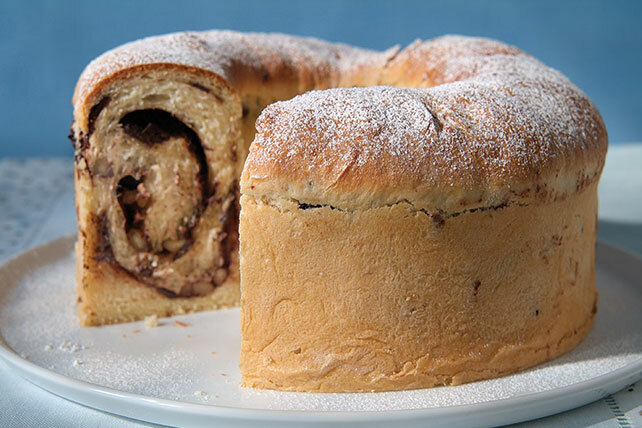 Show off your cooking skills and surprise your family with this delicious Chocolate Babka. It's the perfect sweet treat for special occasions! Combine milk, 1/2 cup butter, the granulated sugar and salt in small saucepan; cook on low heat until butter is completely melted and mixture is well blended, stirring frequently. Set aside. Sprinkle yeast over warm water in large bowl; stir until yeast is completely dissolved. Stir in milk mixture. Add 3 cups of the flour; stir until well blended. Add the whole egg and egg yolks; mix well. Gradually add enough of the remaining flour to form a soft dough, stirring until well blended after each addition. Place in separate greased large bowl. Brush top of dough with some of the remaining melted butter. Cover with plastic wrap. Let rise in warm place 1 hour or until doubled in volume. Punch dough down; divide in half. Place on lightly floured surface. Roll out each dough piece to 16x10-inch rectangle; brush lightly with some of the remaining butter. Sprinkle dough rectangles evenly with chocolate, walnuts and cinnamon. Starting at the one of the short ends, roll up each dough rectangle. Place one of the rolls, seam-side down, on bottom of greased 10-inch tube pan. Place remaining roll, seam-side down, next to first roll on bottom of pan, slightly overlapping first roll. Pinch ends of both rolls together to seal. Cover with plastic wrap. Let rise in warm place 45 min. or until doubled in volume. Remove plastic wrap; brush with remaining butter. Preheat oven to 350°F. Bake 40 to 45 min. or until golden brown. Cool in pan 5 min. ; remove to wire rack. Cool completely. Sprinkle with the powdered sugar. Enjoy a serving of this classic recipe on a special occasion. Instead of sprinkling with the powdered sugar, top with an easy glaze instead. Just mix 1 cup powdered sugar with 5 tsp. milk until well blended. If necessary, stir in up to an additional 1 tsp. milk until glaze is of desired consistency. Drizzle over cooled bread. Let stand until glaze is set.